Dei galne har mange morosame stunder som den vettige ikkje har(The maniacs have many funny hours that the sane guy does not have). Thing One has forgotton his p.e kit. Again . After mithering for weeks about how utterly and absolutely important it was to have it it took us telling him five times to pack it and a further several days of reminding him to take it he's still, you guessed it, not taken it. Until yesterday that is, which was rather unfortunate for the authenticity of his costume, I'm rather certain Vikings, Romans and Celts didn't support Manchester United. Still it did ensure that this little viking could participate in netball club upon his return. Yesterday Thing One's class visited Martin Mere to experience a day in the life of a Roman/Viking/Saxon. However, it wasn't so simple as just waving them off with butties in a carrier bag and the vague hope that if they puke on the coach, it won't be over their uniform. Oh no, after the three page letter positively gloated that we only had to pay £9 towards it (bare in mind the school is in a socially and economically deprived area) they then went on to inform us that they must be in authentic costume. Oh and they must have an authentic lunch as they dictated to us what kind of bread, fillings and fruit they were allowed (apples were fine, bananas weren't. ) and even going so far as insisting it should be wrapped in brown paper and string or a teatowel. All this for the bargain price of £9 (+ cost of costume + cost of wellies + cost of dinner + time taken to source and make costume) Terrific. Spiffing. I was literally exuding excitement. Did you feel it? Predictably most parents went down the bedsheet toga route of an upper class Roman, or a peasant draped in the emergency picnic blanket borrowed from the boot of the car. I say most as there were a few anomalies such as Thing One's friend who looked like some homosexual Mexican bandit on a tremendous drug high crossed with George Michael complete with bright turquoise blanket poncho style and a disturbing beard made from mascara (not pubic hair, it just looked like it) Poor kid. As most of you know I'm terminally uncrafty. I have no craft gene. None. I sent The Husband on a mission to Abakhan only to get a phone call saying there was nothing at all like I'd asked for and it was all terribly expensive. Turns out the silly bugger had gone to bloody HobbyCraft, yet apparently I'm the ditzy one in the relationship. Still a few snips and rips later and we had a fur-ish tabbard and arm doodahs. Phew. 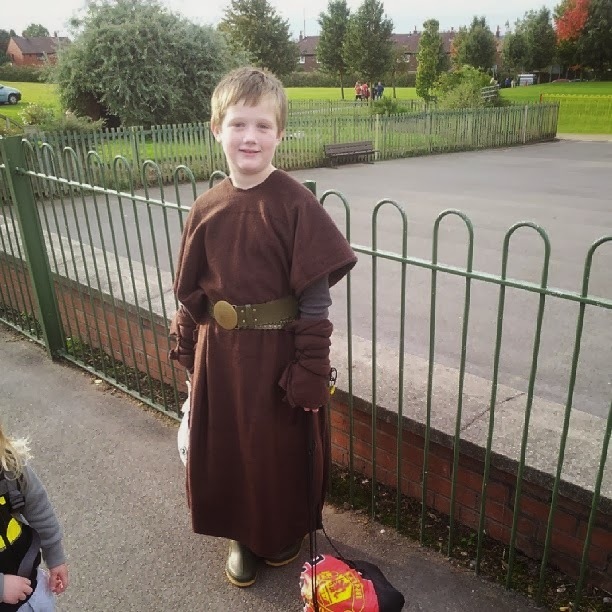 I was feeling somewhat pleased until a friend remarked how cool the young Jedi looked. Arse. Still, I guess it was all worth it seeing as Thing One didn't pause for breath once during the walk home. They went foraging, played with wooden weapons, ate around a fire, made stew and oatcakes and he even made me a darling little woolen bracelet. What he doesn't realise is that we're going to make him dress as a Viking every weekend for a year, you know.....just to get our money's worth and all. Oh and because we're horrifically mean parents.